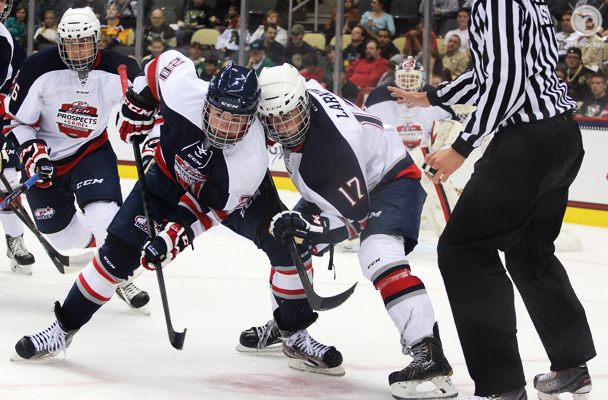 The 2013 CCM/USA Hockey All-American Prospects Game looked like it was going to be a low-scoring affair. That is, until Dylan Larkin got involved. The Waterford native used his quick hands and puck skills to slide the puck through teammate-turned-opponent Ed Minney’s legs early in the second period to break open the scoring. “He opened up his five-hole, but I didn’t even look, just threw it there,” a modest Larkin said after the contest. It really wasn’t a surprise that Larkin was the first to the scoresheet; the standout forward with the U.S. National Team Development Program Under-18 squad is expected to be an offensive force at higher levels, as well. Larkin, a University of Michigan commit, was rated as an ‘A’ prospect by NHL Central Scouting – the lone Michigan product to earn that letter grade. He’s already on track for a impressive 2013-14 season, recording five points in three USHL contests. Last season, he posted 14 points in 37 USHL contests. “When you look at him from last year to this year, you see not only the physical development, but the confidence that comes with it,” said TSN draft expert Craig Button to USA Today. He finished the AAPG with a goal and an assist, and helped linemate Keegan Iverson earn player of the game honors. Mark Johnson, coach of Team Johnson at the event, said he was impressed with the duo’s performance. Larkin said that he tried to ignore the fact that scouts from across the globe were at the CONSOL Energy Center to watch him and the gathering of top draft-eligible prospects, but that it was a bit nerve-wracking early on. The Waterford native said he hopes that scouts left the game with an impression that nobody works harder on the ice. 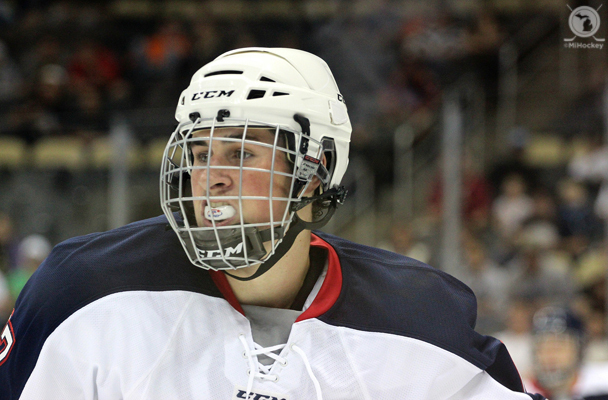 Larkin will wrap up his second season with the NTDP before heading down the street to Yost Ice Arena next fall to skate for Red Berenson and the Wolverines.